In grounding politics in Badiou’s events and truth-procedures and Critchley’s demand/approval; in critiquing modern anti-Capitalist movements for following the form of Capitalism; in judging all political thought on coherence and fidelity to a system of thought, we are left with an obvious question: what is the structure of this thought system? What should a political sequence look like, what are the rules which it must follow? We find our answer in a (perhaps) unlikely place: the Tractatus Logico-Philosophicus. Wittegenstein’s work is a discussion of language and logic. But it contains a great truth: that our thinking is determined by language, only exists through language, and is therefore limited by the limits of language. So, in tracing out a theory of language, Wittgenstein is also, unwittingly, tracing out the form of all political (and, indeed, ethical) thought. For a politics of singularities says that those singularities must abide by a logic, and that logic is the human logic of language. In order to represent logical form, we should have to be able to station ourselves with propositions somewhere outside logic, that is to say, outside the world. This is the reason for the inherent subjectivity of human experience and, therefore, the basis for thinking of politics in terms of interiority and singularity. The form of our thinking are only accesible by finding their points of contradiction and meaninglessness–it must be found and traced out from within, not discussed from some objective place. Hence the ridiculousness of human rights theory and the measuring of political sequences by “objective” standards. 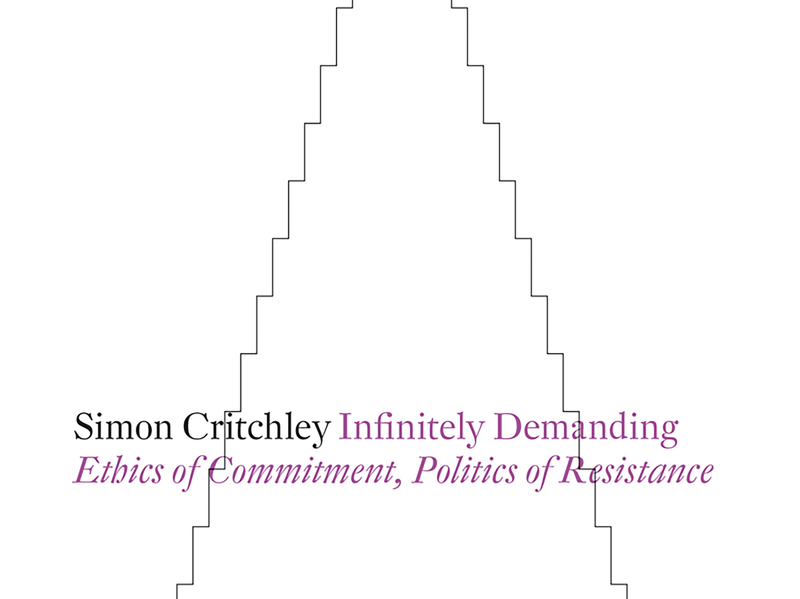 Within politics, then, Events create singularities and political subjectivities through the mechanism of Critchley’s approval/demand. These Events have certain terms which must be followed by those who approve of the demand (e.g., for one who is moved by third-world poverty, she must work to allieve the poverty by donating money or reforming IMF regulations). Each of these singularities stands alone from other singularities, placing us in a multiplicity of political subjectivities which cannot be reduced to one another. To say the maxim of an Event is universalizable is muddling, misguided. For, in fact, there are no universal facts or Events, but always a universal form–that of the human condition. This is what makes each if these political subjectivities a human subjectivity. Each subject is a human subject and a political sequence must abide by that form. It is this form with which Events must be coherent. Speaking of ‘universalizability’ is only to say that a sequence abides by the forms of human logic (the human condition). The values (variables) of the Event will never translate to another subjectivity. That is, the demand cannot be brought upon others who do not hear/approve of it. But by following human logic, the political procedure that begins with the Event can retain meaning and the space of being so that others can join it if the demand does call on them. If the political sequence does not follow its logical scaffolding, it will collapse and become meaningless. This is the incoherence of Saint-Just. Further, there is a logic specific to each singularity. This logic is determined by the Event which founds the subjectivity and the political sequence. It is a logic that must have the same form as human logic but which, within that form, has its own terms and rules to be followed–an inner form. It is possible to imagine various societies which abide by the logic of the human condition: the specific kind of society, as long as it is coherent in that manner, is arbitrary. But once a society is chosen, its (inner) form must be followed for it to be viable. Contradiction is the outer limit of propositions: tautology is the unsubstantial point at their center. This is exactly the same with political subjectivities. The subjectivity is founded in the Event and the demand which lies at the center as the unchallenged point of beginning, the foundation that is true by the very fact that the subjectivity exists. It is tautological. It is meaningless for a Soviet to say that Capitalism must be overturned, just as it is meaningless for a immigration reform activist to say that the Arizona immigrations laws are unjust. The contradiction is the limit at which the system collapses, where thought can go no further, the limit we must live on. Thinking in a way incompatible with the inaugural maxim makes the political sequence meaningless. Any turn of events which contradicts that founding Event destroys the sequence. This is a lack of fidelity. The problem with anti-Capitalist movements today is that they use the form of Capitalism while thinking that there is some different Event and maxim which they are acting in accordance with. This makes those movements utterly meaningless. A true politics will recognize that the logic of the singularity guides one’s thought and is itself guided by the logic of the human condition, which is formed by language. Politics can only have truth and meaning within those limits: coherence and fidelity.